There may be less than one month left of the official winter season but as anyone in Alberta knows, the spring solstice is just a dot on the calendar and nothing more, no matter what Balzac Billy has to say. That being said, some businesses in the area take their foot off the gas at this time of the year when it comes to protecting their brick and mortar from the weather. As Central Alberta’s commercial builder, we thought it timely to step in with some important tips to keeping your shop prepared for all that can befall it at this juncture. Preparations should begin from the top down. This is because late season snowfall can catch you off guard and dump a heavy load of snow on your roof. If there are any underlying problems, the concern is compounded and can lead to significant damage. Start by performing a thorough inspection of your roof, including shingles/tiles, gutters, and downspouts. Remove any debris and be sure to attend to necessary repairs. If your building is old, do some research to find out if it meets Alberta building codes regarding snow load, which accommodates a minimum of 22 pounds per square foot. Once done to satisfaction, schedule regular snow removal until spring temperatures have not only arrived, but settled in for the year. Lastly, be honest with yourself. If your inspections have uncovered issues significant enough to have you performing excessive (and expensive) roof maintenance through all winter seasons to come, it may be time to consider a metal roof installation or other form of retrofitting. View more on how to protect your commercial roof through all days of winter. Poor insulation in the walls can not only provide customers/clients/staff with a poor experience, it can dramatically increase your monthly utility expenditure and thus make a direct hit on your bottom line. In addition, if the commercial property has not been updated to meet Alberta’s 2016 building code energy efficiency requirements regarding your building envelope, you could be in hot water this winter. Have your building envelope inspected and make sure your insulation is not only up to code, but doing all that it can to keep your utility bill down through the remainder of the season, and beyond. Pipes are also vulnerable in the late winter. They have spent an entire season expanding and contracting with the changes in temperature. During especially dramatic drops in the mercury, frozen pipes in the walls, floor, and ceiling of your shop can fracture, resulting in significant water damage. This can endanger customers/clients, staff, products, materials, and equipment. Have your pipe system inspected by a professional to ensure that they have not been damaged over the last few months, and that they can continue take the brunt of extremely low temperatures. This step is even more necessary for boutique shops operating in older heritage-styled buildings in Red Deer, Sylvan Lake, and other Central Alberta towns. One unique threat common to the late winter season, is snowmelt. When heavy periods of snowfall are followed by seasonal rises in temperature (and Alberta chinooks) your commercial building becomes susceptible to the threat of water damage. Thankfully, if you’ve committed to adopting our first winter protection tip (item #1 above) you will have taken a big step to keeping safe from snowmelt. A roof and gutter system free from disrepair is well prepared here. Beyond that, older heritage style shops will want to make sure their downspout openings are positioned away from the building foundation, and yet away from foot traffic (especially if freezing overnight temperatures persist). Also be sure to perform regular snow removal so that you don’t compound the potential for snowmelt water damage at your foundation. Shoveling snow against your building to keep the sidewalk clear for pedestrian traffic is a bad idea. It should be removed altogether. 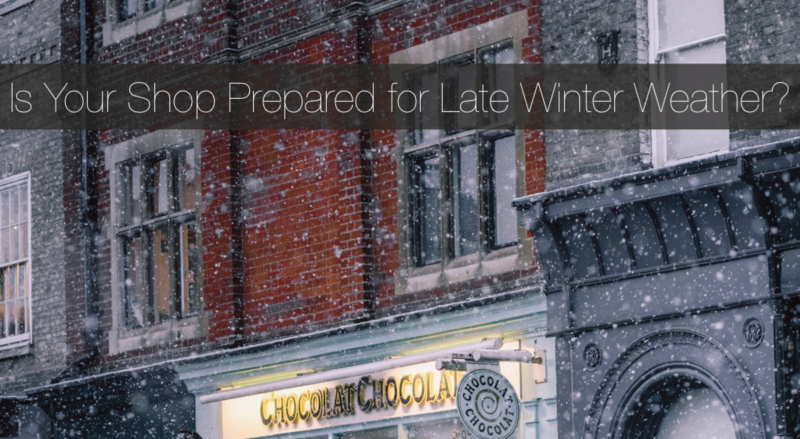 If you have any concerns about the ability of your roof or building envelope to maintain through all winter seasons to come, it may be time to make a wise investment in a commercial building renovation. If you operate in Central Alberta, contact Apple Building Systems for a consultation.